Short-wearing season is over, and with it, the end of the ritual. Ritual? Argh, yes, the ritual. 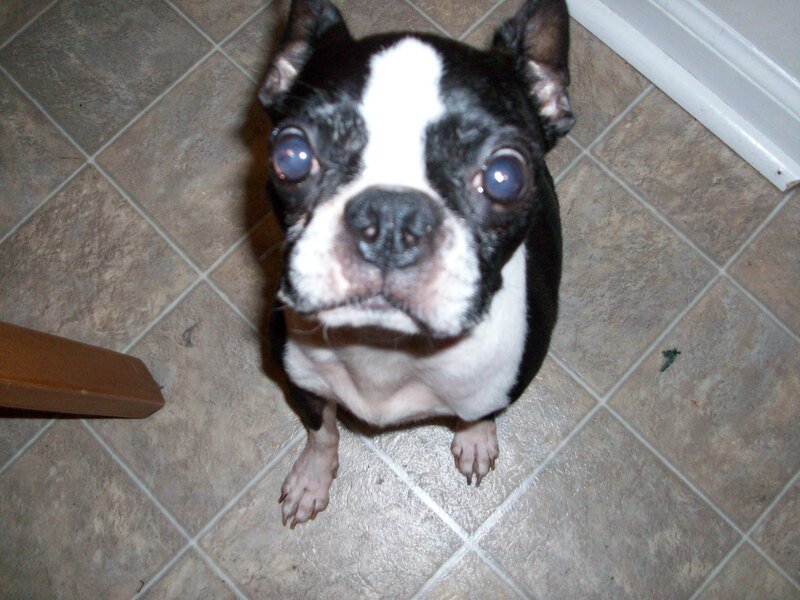 You see… I have three Boston Terriers, one of whom is the little old man. He is indeed the littlest of the group at 10 pounds, as well as the oldest, at, well, we’re not really sure, because he was from a puppy mill, but the vet puts him at around 13 or 14. Our little old Timmy is nearly-blind – he walks into walls and furniture, and deaf – you have to scream before he turns his head in acknowledgement of your existence. Of course, his deafness could be a keenly-honed avoidance mechanism. But whatever it is, our happy little old man romps around gaily, when he isn’t sleeping, that is. And he does a lot of that! Timmy is wickedly spoiled, and one measure of this is “The Ritual.” It goes something like this: during the last several years, Timmy’s favorite thing in the whole wide world to do is lick my legs. He is relentless. Anywhere I am sitting with my legs bared, there is Timmy at my feet, licking madly away. He takes this activity very seriously and would go on and on, forgoing even naptime, if so allowed. One of the places he especially likes to do his licking thing is in my office, which is where the full ritual occurs. He licks and licks and licks until he gets plum-tired out at which point he puts his front paws on the side of my chair and ogles me with rheumy-eyes, making his request to be placed on the daybed for his daily snooze. He is thusly placed. Only this is usually not a one-shot deal. For whatever doggy-reason, he doesn’t settle into his final nap until after he’s done several rotations of down-lick-ogle and be-placed-on-bed. With fall and jean season here at last, the ritual is on hiatus. For now, Timmy sniffs hungrily at the cuffs of my pants, occasionally finding a spot or two where he can get a few licks in. But with winter fast approaching, my soon-to-be head-to-toe covering means my little old man gets tons of goodies and loads of under-the-covers time. I love Boston Terriers. A coworker had one who I met as a 3-month-old puppy. She would lick my hand as I reached out to pet her. Then the head of the department sent out a message that dogs were no longer allowed. I suppose it was because some people were allergic to dogs, but I missed my puppy kisses. Thank you for sharing, I miss my little BT so much. Almost 6 months now since we said our good byes. I truly hope that Otis is going to be waiting at the gate when my time comes. BT’s have got to be one of the best companions. I now have a tiny little Yorkie girl. She is loving as well, but most certainly not the same as Otis in any way shape of form. Again thank you for sharing, brings many memories flying back. Your comment brings tears to my eyes. I’ve had other breeds in the past — and I truly love all dogs — but there is just something about these little guys that’s unique. When we have them, life becomes so special, but when they walk the Rainbow Bridge, there is just no worse pain. I am sorry for your loss of Otis, but glad you have your little Yorkie to fill at least part of the gap.